As I’ve mentioned previously, the documentation for xperf (Windows Performance Toolkit, also known as ETW) is pretty weak. In this post I’m going to attempt to explain the meaning of the extremely subtle and non-obvious columns in the CPU Usage (Precise) Tables, which display every context switch recorded in the trace. Understanding these columns is important when analyzing idle time, which is one of xperf’s most valuable features. The CPU Usage (Precise) table is one of the worst offenders for having confusingly named columns. Quick – what’s the difference between Switch-In Time and Last Switch-Out Time? And is New Prev Out Pri a real column name, or is it a made-up compound word? 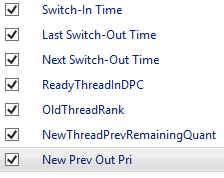 And is ProcessOutOfMemory really a column in the context switch table? Stick around and find out. WPA 10 adds some spaces and hyphens to the names, and tooltips, but documentation is still needed. This table is labeled CPU Usage (Precise) to distinguish it from the CPU Usage (Sampled) data. The sampled data comes from interrupting the CPU frequently – sampling – and seeing what it is doing. The precise data that is discussed here comes from instrumenting the context switch code in the kernel. Every time a thread starts or stops running the precise time of this activity is recorded, with optional call stacks. This means that the CPU Usage (Precise) data can tell exactly how much CPU time each thread consumes, and what the call stack looked like when a thread lost/gained the CPU. However the CPU Usage (Precise) data can’t tell you what a thread is doing between context switches – that is the job of the CPU Usage (Sampled) data. Understanding this difference is crucial. UIforETW’s default startup profile shows the CPU Usage (Precise) data in graph form, because this is the most accurate graph for showing how much CPU time is used by each process. If you want to see details of the context switches you can click on the Display graph and table button and the table will appear below the graph. With these columns available you can easily drill down to where your threads go idle, see how often they went idle and for how long, see what call stack they went idle on, see what thread from what process woke them (and that call stack), and more. It’s pretty amazing. All of the columns in the CPU Scheduling summary table show data that is related to a particular context switch (or multiple context switches grouped together), and the grouping (by the columns to the left of the orange bar) affects how many context switches are displayed on each row. With the recommended default view there will initially be one row for each process, and as you drill in more rows will be revealed. The grouping by stack is particularly important since it lets you see the big picture more easily. Any threads or processes that did not have context switches during the visible time period will not show up. Before diving into the columns (there are over 60 of them!) some concepts and prefixes need to be covered. Waiting – not ready to run because the thread is waiting on something through a call to WaitForMultipleObjects, EnterCriticalSection, ReadFile, etc. Running – the thread is running on one of the CPUs, executing instructions and getting work done. Threads move from ready to running when a CPU is available. They can move back to ready (if they lose the CPU) or back to waiting (if they wait on something). There are other intermediate states used by the scheduler to improve scalability such as DeferredReady and Standby, and states such as Initialized and Terminated for new and dead threads, but those shouldn’t normally be relevant for performance purposes. New Process/Thread: this is the process/thread that we are switching to – the one that is starting execution at this point. This may be the idle thread – when a CPU is idle it is considered to be ‘executing’ the idle thread. The New Thread is moving from Ready to Running. Old Process/Thread: this is the process/thread that we are switching away from – the one that has lost (or relinquished) the CPU. This may be the idle thread. The Old Thread is moving from Running to Waiting or to Ready. Readying Process/Thread: this is the process/thread that ‘readied’ the new process – that satisfied whatever it was waiting on. This could be a thread that released a critical section, or set an event, or something else. This readying could represent keyboard input, completion of file I/O, receipt of a network packet, or many other possibilities. Sometimes there is no readying thread – this happens when a thread wasn’t waiting for anything except more CPU time. Sometimes the readying thread is a DPC, which means it comes from a random thread that was hijacked to run the DPC code – watch for it. The Readying Thread’s state doesn’t change during this context switch, and at the time of the context switch it can be in any one of the thread states. In short, a context switch, as recorded by ETW, is the act of moving the New Thread from Ready to Running, and moving the Old Thread from running to some other state, on a particular CPU. Some documents suggest that Windows always ensures that the highest priority threads are running, but this is a half truth at best, and usually irrelevant. This priority guarantee is a half truth because current versions of Windows actually only guarantee that a particular CPU is running the highest priority thread in its per-CPU queue. It is quite possible for a high-priority thread to stay in the Ready state for a few quanta while a low-priority thread continues to run on another CPU. In addition, the priority guarantee is usually not relevant because threads are constantly having their priorities adjusted, so you can’t usefully know what priority a thread will have at the time (although you can see it in the ETW trace). See this presentation for more details on Windows thread scheduling. Time has two different meanings in this summary table. Time (s) refers to a point in time in the trace (with units of seconds). Time (us) refers to a duration – a length of time (with units of microseconds). Thus, the units of time are crucial clues to the meaning of a column. That is how we can end up with column names such as New Prev Out Pri which is the Priority of the New thread at the end (Out) of the Previous time that it ran. Phew. New/Readying/Old Process Name – this is the name of the process (i.e. ; devenv.exe) without the process ID. This column is useful when you want to group all processes from one executable together. Count – this is the number of context switches summarized by the current row. When the first column is NewProcess and all of the data is collapsed this represents the number of context switches per process over the selected time. As you drill down into the data you will eventually get down to individual context switches and the count will be one. New/Old InSwitchTime (μs) – these represent how long the new and old threads will/did run – these are the elapsed time between the current context switch and the next/prev context switches – see the Learning through exploring section below for more details – these columns no longer exist in WPA 10. CPU Usage (ms) is the closest substitute for NewInSwitchTime (μs). Switch-In Time (s) – this is the time of the context switch. Annotation – this, column, which is available on most or all WPA tables, can be filled in during trace analysis. See below for details. Next Switch-Out Time (s) – this is the time of the next context switch. Or, as the name wants you to think about it, this is when the new thread will be switched out. New/Old Qnt – these are always -1, even on Windows 10. This appears to be an old and unfixed bug. ProcessOutOfMemory – unknown, and doesn’t this seem out-of-place in context-switch data? 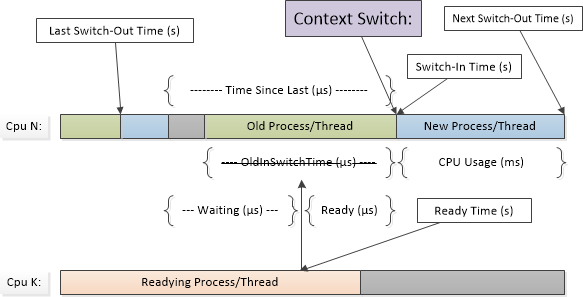 InSwitchTime (μs) is the length of time that a thread is running, from the context switch where it starts running to the context switch where another thread starts running. This can be verified by taking SwitchInTime (s) on the selected row, adding NewInSwitchTime (μs) (remembering to divide by 1,000,000 to convert to seconds), and noting that the result is the SwitchInTime (s) for the next row – the next context switch. By selecting a few thousand rows, copying to a spreadsheet and doing some Excel-fu you can quickly verify this. The OldInSwitchTime (μs) is how long the old thread ran, and the NewInSwitchTime (μs) is how long the new thread will run. The NewInSwitchTime (μs) is not known at the time that the context switch happens, but xperf helpfully calculates it at analysis time. You can see that the OldInSwitchTime (μs) for a given row (when sorting by SwitchInTime (s) and when there is one context switch per row) is just the NewInSwitchTime (μs) from the previous row (the previous context switch). Aside: I don’t know what Outlook is doing in the screenshot above but it appears to be suffering from Attention Deficit Hyperactivity Disorder. In total it flips back and forth between it and the idle thread seven times (not all shown) and it never runs for more than 0.02 ms. That can’t be good. When tracing through chains of readying threads (thread A waiting on thread B which was waiting on thread C…) the identify of the readying thread is crucial, but sometimes it is irrelevant. If a thread was not actually waiting (if it was in the Standby state due to CPU starvation) then there will be no readying thread. If it was waiting on a timer (calling Sleep or a call to WaitForMultipleObjects that timed out) then the readying thread appears to be whatever thread happened to be running on that CPU – watch for KiProcessExpiredTimerList in the ReadyThreadStack for random threads. That’s because DPCs effectively ‘hijack’ other threads and run in their context, and WPA doesn’t expose that at a high level. If you understand how summary tables work and you understand the data that they are presenting you with then there are many rich explorations of CPU Scheduling that you can do. If you figure out a cool technique, let me know. If you find any errors, or new or better column explanations, please share. I didn’t figure out the significance of Time (s) versus Time (μs) (point in time versus duration) until I was researching for this post. In fact, I didn’t figure it out until about half an hour before publishing this post. Knowing that distinction is going to make this summary table much easier to use, and justifies the time I spent writing this post. Microsoft’s documentation has improved a lot. See this page for a different perspective. This entry was posted in Documentation, Performance, Programming, xperf and tagged CPU scheduling, documentation, summary tables, xperf. Bookmark the permalink. 1) IdealCpu factors into where you’ll see cases of high priority threads ready while lower pri guys are running on alternate cpus… the scheduler chooses the ideal cpu if there is no better idle cpu to run the thread and then uses priority to determine whether to preempt or queue. The ideal cpu column actually refers to the ‘old’ ideal cpu, which even trips up scheduler experts from time to time. 2) previous c-state refers to the last sleep state of the cpu when the oldthread was the idle thread. It has no useful meaning in other cases. It may be instructive to look at if you have patterns where you distribute lots of tiny pieces of work to threads and join on the results. It’s possible to get in a regime where more time is spent waking up from deep c-states than doing work. This would show up in 100us – 800us ready times where the target core was actually idle. Am I missing anything? I’m not sure that accounts for all that I am seeing, or else perhaps I just need to look more. I could never get c-state to display what looked like meaningful data, but I’ll look more closely. BTW, you should ask the xperf guys to document this. It’s tragic that it’s so hidden. Thank you for your posts about xperf, they have been a great help for me. There is one thing I didn’t get to work yet. Do you know how to get the name of the thread to be shown in xperfview or wpa? Or is this not possible? It is not possible to get xperfview or WPA to show the names of threads. Pity. Setting a thread name (see http://msdn.microsoft.com/en-us/library/xcb2z8hs(v=vs.110).aspx) is supported only by debuggers, and perhaps a couple of other tools, probably because it is a tacked on hack rather than a first-class feature. If the thread names are that important then why not emit custom events with the names. Each thread could emit its own name, or the main thread could emit events with name/threadID pairs. The trick is to make sure that this is recorded, so either your program needs to know when it is being recorded, or else it needs to emit this information every ten seconds or so. Emitting custom events isn’t as convenient as seeing thread names in the UI, but at least it guarantees that the information is consolidated in one place. See https://randomascii.wordpress.com/2011/08/18/xperf-basics-recording-a-trace/ for an example custom provider. It still not clear to me what the “Count” represent. o.k. so it saves the number of context switch,is it the number of context switch of the new process? and if it is, in what duration? or maybe the context switch of other processes while the “new process” is running. It is not very clear what this field represent. Count is the number of context switches over the time being analyzed (in WPA this is the currently visible time range) for that row. If you drill down all the way then Count will always go to 1, because at that point each row represents a single context switch. If your leftmost column is Process and you haven’t drilled in at all then Count is how many context switches for each process over the time being analyzed. If you have drilled down a bit then the meaning will change, depending on what rows you have to the left of the orange bar and how far you have drilled in. Note that in xperfview/WPA a context switch is counted for the New Process/Thread, not the one that is being switched out. I hope that makes sense. If not, let me know. O.k. so from what I understand now, the count field is the sum of all the context switch of new process in the duration time specified in the NewInSwitchTime, is that correct? lets say the NewThreadStack is a nieghbor to Count field, and I drill into the call stack (NewThreadStack field). from looking at the call stack, what the Count field represent? Is it the number of context switch while this function/thread was starting to execute until it finish its duty(what I am actually saying is that while this function/thread was executing it was interrupted by #sum of context switches)? Are you using xperfview or wpa to view the traces? In xperfview you select a time range and then view a summary table. Within that summary table the count columns tells you how many context switches there are per-row, and your grouping tells you what that row actually contains. NewInSwitchTime is not relevant. In WPA you are always viewing a summary table and the relevant time range is the entire visible time range — zooming in and out affects what is being displayed, and hence the count field. If you are looking at a particular thread and drilling down in the stack then at a particular point in the call stack the count field tells you how many times the OS switched to that thread on that sub-callstack. Ultimately the count field tells you how many times a thread or set of threads were given a chance to run. Your grouping affects what thread or threads are being summarized, and what call stacks are being summarized, and you are in charge of what time period is covered (see above). Play around with it. Zoom in to a small time range in WPA and experiment. Try some experiments. That’s how I figured out most of the columns. You’ll figure it out. I begin to use WPA to analyze power issue of applications recently and your great posts help me a lot. Thanks you! I think it may help in identifying some of the unknowns you described.